Brian Anderson and Nike Skateboarding will be releasing another Nike SB Dunk High together for the Spring 2018 season. Their partnership dates back to the late 2000s. This iteration of the popular Nike SB Dunk High features a Black tumbled leather upper with canvas underlays. Other details includes a perforated toe box, Brain Anderson’s “BA” stitched on the sides atop a Gum rubber outsole with graphic insoles. 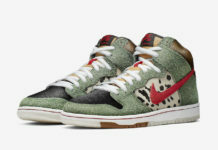 Look for the Nike SB Dunk High “Brian Anderson” to release very soon at select Nike SB retailers and Nike.com. UPDATE: Nike announces that the “Brian Anderson” SB Dunk High releases on March 19th.